Sara is originally from the Maryland Eastern Shore. She attained degrees in music from both St. Mary's College of Maryland and her masters in music from the University of Cincinnati in Ohio. She began playing piano at age 4 and professionally at the age of 14. She won first prize in the W.A. Virts Piano Concerto Competition in high school at 18. Critics have written that Sara's musical voice is "lush", that she "beguiles and charms" the audience with her "velvet embrace" of the music. These qualities won her the " Billie Holiday Vocal Competition" in 2004. Since then she has toured and performed through out the U.S. Her bio indicates that she "has performed as a soloist with the National Symphony Orchestra, Cincinnati Pops Orchestra, and Ravinia Festival Orchestra, under the batons of Emil de Cou and Erich Kunzel. An additional highlight includes a solo performance on the Esplanade with Keith Lockhart and the Boston Pops Orchestra. In the local Baltimore/Washington area, Sara was a featured vocalist with the Jazz Ambassadors and has graced the stages of the Hippodrome Theater, Meyerhoff Symphony Hall, and the Kennedy Center for the Performing Arts." While a full-time singer, Sara also performs as a pianist and accompanies both singers and instrumentalists on recitals. 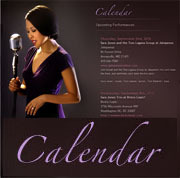 She is a featured vocalist on The Young Brothers CD "Tales of Time" (2007) on CD Baby.com. Notably, Ted Gioia of Jazz.com wrote the following about Sara for her rendition of "Skylark" on the "Tales of Time" CD, "Many celebrated vocalists have tackled "Skylark" over the decades, but Jones can withstand comparisons with these past masters. A talent this large deserves a bigger stage." 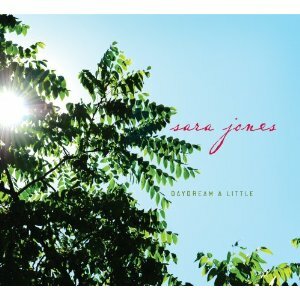 Sara released her first CD in 2010, a 14 track compilation titled " Daydream A Little", which is available through Amazon and other online vendors. Sara is a regularly featured singing artist in the DC/Baltimore, MD area and can be heard performing around the U.S.
"If l asked you to "Daydrearn a Little," what would you daydream about? Lounging outside in the sun? Curling up with a good book? Exploring an exotic locale? Savoring something flavorful and delicious? Enjoying the pleasure of someones company? Whatever form it takes, your daydream is uniquely yours. In an instant, it can transport you to another place, foreign or familiar. Perhaps it may remind you of a pleasant memory in your past, or inspire you to explore possibilities in your future. lt could make you smile, laugh out loud, or even leave you breathless. Taking the time to daydream allows us to look inward and find a hit of happiness through our own imagination. DCB:	I read that you won the W.A. Virts Piano Competition, but it does not say in what year. When did this occur? SJ: I won the W.A. Virts Piano Competition in 1994. I was a senior in high school and was really excited to win. DCB:	I see your winning the 'W.A. Virts Piano Concerto Competition' as a validation of your mastery of the keyboard. Clearly your winning of the "Billie Holliday Vocal Competition" showed that your vocal skills are also significant. Your bio says you continue to play the piano as a piano accompanist so that art is not lost. The playing of the piano is not your primary musical focus. When did you realize that you desired a singing career over that of a pianist and what influenced the decision? SJ: I discovered that I enjoyed singing during graduate school at the University of Cincinnati College-Conservatory of Music. ( I know, it's a mouthful!) I was getting my master's in piano accompanying, and realized that I would rather be singing than playing for singers. Plus, singers can only sing one note at a time....pianists are responsible for LOTS more notes at a time. I still love to play, but didn't want piano performance to be my bread and butter. I'm still elated to be pursuing music as a career. I think I'd be very lost if music wasn't a part of my daily life. DCB:	During your career in music, which musicians you have performed with that have had the greatest impact? Were these instrumentalists or singers? SJ: As for people I have worked with that have made a musical impact on me, I have a long list of very talented players from the area. Too many to mention! But if I was to name a few, bassist Paul Langosch, and pianists Steve Rudolph, Jay Cooley, and Robert Redd are some names. I also have enjoyed working with the Unified Jazz Ensemble several times this year. They are a great, fun, group. DCB:	Is there one or more concerts that stands out in your memory and what do you remember from the experience you might like to share? SJ: Some of my most memorable experiences are these: One of them is as a pianist, the 2 others as a singer. 1. Performing with my mentor and teacher, pianist Brian Ganz. We played Ma Mère l'Oye (Mother Goose Suite)--a piano duet by Maurice Ravel--on one of my student recitals at St. Mary's. He's a true, true, artist. The piece was not technically difficult, especially for him, but he is always able to make even the simplest work a piece of art. It was a true pleasure to play alongside him. 2. Performing for the 4th of July Celebration as a vocal soloist with the Boston Pops and Keith Lockhart. 3. Performing a concert this last April near my hometown on the Eastern Shore in Oxford. It was so great to see so many familiar faces; I had known many of them since I was little. It was a proud moment for me. I had an amazing time! DCB:	As I was completing the Q&A I was listening to your music on MySpace and was thinking about how much I enjoy Brazilian music. I think Portuguese is one of the most beautful languages when sung. The music from movies like "Black Orpheus" and "Donna Flora And Her Two Husbands" have great Brazilian soundtracks. What attracted you to the styles of music you perform and what specifically to Bossa Nova and the music of Brazil? SJ: I really fell in love with Brazilian music in grad school. I had some friends who listened to it a lot, and I grew to love its sound. And yes, Portuguese is a beautiful language. Once I started singing more and playing the piano less, I wanted to experiment and try performing some Brazilian standards. I really enjoyed those pieces, and now some of them are permanently in my repertoire. 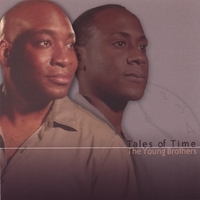 DCB:	You are featured on The Young Brother's CD. You have your own songs on MySpace and your website. Do you have plans to release your own CD in the near future? If are planning on releasing a CD, when might we expect to to reach the stores or to be available online for purchase? SJ: As for my CD, I'm aggressively trying to get a recording done. The songs on my pages are of studio work that I completed a couple of years ago. Now, I'd like to start from scratch and create something new. I have a producer who is helping me with all the details, and I'm really excited about the project. I hope to have it completed and available for sale in Spring of 2009. I'm asking folks to add their names to my e-mail list---when the CD is complete I'll send out a notice.